Writers about music in the sixteenth and seventeenth centuries drew extensively on classical mythology to exemplify its powerful effects and importance to society. With little in the way of musical exemplars from classical antiquity to inspire Renaissance musicians as the literary and architectural remains of Antiquity might, the reputation of Greek music was founded was instead on its theoretical or philosophical texts, and myths of music’s wondrous powers. It was these myths were most accessible and evocative in shaping conceptions of music. The most famous figures were Orpheus, Amphion and Arion who were fabled to have tamed wild beasts and dolphins or caused trees and stones to move with their music. These stories provided themes for song and spectacle – for example the numerous Orpheus plots in early opera. Yet did early modern people really believe about these tales? Did they truly believe in an Orpheus whose music had literally tamed wild beasts and gained him entry to the underworld, or that Amphion’s music had built the walls of Thebes? Such is [music’s] sweetness that it moved a fish, bestial by nature, dull of sensation and all but deaf, to bear a man riding on its back over the bounding main; that it could move rocks and trees when Orpheus sang, rivers and beasts when did Amphion. Yet beyond such rhetorical usage, authors were generally aware that these stories were fables, the feigning of poets, which required special treatment.The question should perhaps not be did they believe, but what did they believe. Certainly they held such stories as benchmarks against which the efficacy of modern music was judged and often found wanting. Yet they also referred to them as the feigning of poets and could be uneasy of their pagan origins. What were the consequences of this belief (or lack of it) for perspectives on the powers of music? And how did such beliefs fare as the so-called scientific revolution took hold during the seventeenth century with its emphasis on generating understanding not from ancient wisdom but rather from observation, experience and experiment? Here Playford treated Orpheus and Amphion as the historical inventors of music, but portrayed their musical exploits as allegories of their achievements as the founders of civilizations. Moreover, in the seventeenth century the authority and status of classical mythology began to change, with consequences for the fabled powers of music. Whereas for medieval and Renaissance scholars referencing mythological stories or classical authorities was sufficient to prove one’s argument, within the new empirical philosophy authority for one’s arguments was to be drawn from observation or experiment. Ancient wisdom underwent a profound shift in status, no longer being regarded as infallible doctrine but rather as opinions and observations to be tested. Thomas Browne’s Pseudodoxia epidemica (1646) was symptomatic of this changing approach to knowledge. He argued that a ‘peremptory adhesion unto Authority’ was the ‘the mortalist enemy unto knowledge’ and saw the tendency to regarded the most ancient times as those nearest to the truth as a delusion. Turning to mythology specifically, he condemns the ‘mendacity of Greece’ which has been ‘poisoning the world ever after’. Pointing out that the Greeks themselves regarded a considerable part of Ancient times to be ‘made up or stuffed out with fables’, Browne cited the sixth-century (BC) Greek Palaephatus who had attempted to rationalise Orpheus’s supposed power over trees. Palaephatus interpreted a less miraculous event behind the story, in which Orpheus had calmed the rage of the Bacchides, who then came down from the mountain bearing branches, thus appearing from a distance like a walking wood. Music retains its power over human affections, but is stripped of its effects on inanimate things, thus making it more credible. For Browne this was the way in which all mythology needed to be re-evaluated. Increasing attempts to provide rationalized interpretations for the astonishing mythical powers of music transformed them from wondrous marvels into everyday phenomena. Moreover Orpheus, who had been regarded as a musical founder of civilization, could now be likened to a common ballad seller or fiddler. In 1592 John Dennis published ‘The Story of Orpheus Burlesqu’d’ in which Orpheus is a mere ballad singer, who charms the mob to leave their work and spouses, and the rustic mob is likened in nature to beasts and stones from the myth. While Dennis’s aim is comic, the same imagery begins to appear in more serious genres too. Fellow of the Royal Society, John Wallis, for example, believed that the mythical stories of music’s power were ‘highly hyperbolical, and next door to fabulous’ and argued that in mythical times music was comparatively rare and that the ‘rustics’ on whom music was said to have its effects, would not have heard the like before. Moreover he draws comparison with fiddlers and bagpipers of his own era who could make the country people dance and skip. The tales of music moving beasts, stones and trees were surely nothing more than what was seen daily in country towns when boys, girls and country people run after bagpiper or fiddler? He regarded the myths as having gradually emerged from the exaggerated re-telling of such ordinary occurrences. The result of this changing attitude to myth was that expectations regarding the powerful effects of music declined and both the ethical justifications for music and the long-held aim of moving the passions came into question. If moving the passions was what any common fiddler or bagpiper could do, then it was not such a worthy aim for those aiming at the height of musical art. Whereas Orpheus had represented the civilising power of the highest musical artifice, he was now was allied with the ill-trained, common minstrel satisfying the passions of ill-educated, rural crowds. For Wallis it was the modern, contrapuntal composer who assumed the role of master of musical harmony for the appreciation of sophisticated listeners with the ability to ‘discern and distinguish the just Proportions’. This ultimately allowed new ways of thinking about music to emerge, valuing it less for its utility and sensuality than for its intellectual pleasures—ideas that would come to underpin the development of notions of fine art and aesthetics in the eighteenth century. You can read more about the changing attitudes towards mythical tales of music’s powers during the intellectual changes of the seventeenth century in my recently published article in Music and Letters. 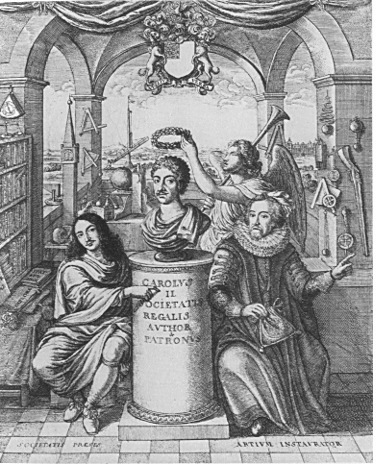 When it was founded in 1660, the Royal Society was the first institution in England dedicated to the study of natural philosophy (what we’d today call ‘science’). In its early years, the society showed considerable interest in investigating the properties of sound and music. There were acoustical experiments, mathematical and theoretical discussion of the nature of consonance, and even occasional musical performances. While the Royal Society was at the forefront of new trends in using observation and experiment to find out about the world, they had not yet left behind older traditions of knowledge. One of these traditions was the idea of the powers of music, founded on miraculous tales from classical mythology (e.g. Orpheus), the Bible (e.g. David driving out Saul’s demons), as well as contemporary wonders such as music’s supposed ability to cure tarantula bites (see my previous post on this subject). I’ve been interested in looking at what happens to these myths of music’s powerful effects in the context of the Royal Society’s promotion of new methods of experiment and observation. Royal Society members did set out to try to test out the truth of some of these stories. One of these concerned music’s ability to break glass. While today we know this to be possible, to the Royal Society this tale would have been every bit as wondrous as stories of music’s ability to cure disease, move stones or tame wild beasts. They received a report from Daniel Morhof (Professor of History at the University of Kiel) who had come across a boy who claimed to be able break a glass by singing. Morhof first asked to witness the phenomenon, then to be taught how to do it. Finally he started to experiment with other ways of making glass vibrate and either shatter or produce sound. On hearing the report the Royal Society commissioned Robert Hooke to begin experimenting, with mixed results. He had success in causing the glass to ring, though failed to make it break. Nevertheless the attempts inspired a whole series of experiments concerning sound and vibrational patterns. The Royal Society was also fascinated with tales of music’s ability to cure the bite of tarantulas from the region of Apulia in Italy. At first they believed in the phenomenon without question: it was, after all, attested to by several intelligent and credible witnesses and authors. Then they received a report from Dr Thomas Cornelio. a physician and natural philosopher from Naples claiming that these musical effects were merely ‘the fancies of the credulous vulgar’. The Royal Society would have loved to get their hands on a live Apulian tarantula with which they could have conducted experiments and tested these claims, but despite Cornelio’s promises, none was received. This left the Society arguing over the accounts of competing authorities and wondering how, if even even these authorities could not agree on the truth of the matter, a natural philosopher’s report of observations was to be distinguished from mere anecdote and storytelling. Perhaps most surprising was the Royal Society’s involvement in contemporary debates as to how modern music measured up the standard of the music of the ancient world, and the wondrous effects described in classical mythology. Experimental Robert Hooke suggested that ancient myths might point to truths about the natural world. He drew parallels between the myth of Amphion moving stones with music and vibrational phenomena in which when two strings are tuned to the same pitch and one is struck, the second sounds too. In both cases music moves an otherwise inanimate object. Another fellow, John Wallis (Savilian Professor Geometry at Oxford) explained the myths as hyperbolic stories rooted in the quite ordinary phenomena of rustic people flocking to pipers and fiddlers, and argued that modern music’s contrapuntal complexities made it superior to ancient music, which he believed had relied on a single voice or instrument. In the early years of the Royal Society myth and science were not yet antagonistic opposites. Royal Society members had a surprisingly firm commitment to the traditional effects of music; if anything the properties of sound they discovered seemed to confirm the underlying truth of these tales. Indeed when contemporary stories came under threat from new evidence, the reluctance of many members to abandon them as false tales indicates an underlying belief in the power of music that was not entirely founded on experiment and reason. While classical myths were no longer the authoritative proof they had been in earlier times, this did not stop such stories forming the basis of lively discussion at the Royal Society or providing inspiration for experiment. Ultimately the Royal Society’s musical discussions would begin to produce new attitudes to music, valuing not for so much for its wondrous effects on the human body and the natural world (increasingly attributed to simpler musics and unskillful audiences), but for the intellectual pleasures sophisticate multi-part music could bring to sophisticated listeners. If you want to find out more about the Royal Society’s discussions and investigations of tales of music’s powers, you can read my newly published article: Katherine Butler, ‘Myth, Science and the Power of Music in the Early Decades of the Royal Society’, Journal of the History of Ideas, 76 (2015), 47-68 (sadly no open-access version is permitted yet, but I will post one once the embargo period is over).